truly knows the Maine outdoors. wilderness survival skills and have completed at least one first aid course. are properly prepared for being in the outdoors and that they stay safe." area, further enhancing the experience of the trip. little research to find a guide who meets your outdoor adventure needs. outdoor opportunities that show off Maine's scenic landscapes and wildlife. the "leave no trace" credo. cannot compare with a day spent navigating whitewater rapids. the area, as well as the most effective bait. and what they're feeding on." bear, moose, deer, fowl and turkey through western Maine's dense forests. instruction. 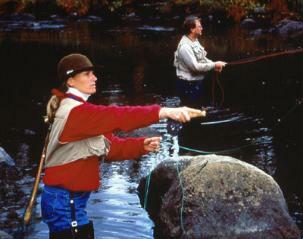 Hill recommends that any first time hunter in Maine hire a guide. can even take you "prospecting" by teaching you how to pan for gold. "There is a whole array of activities that guides are involved with," said Hill. specialize in nature photography, wild flowers and bird watching." first-hand knowledge of the region. because we are out here all the time." just for the customer but for the guide too. a Registered Maine Guide and start planning your adventure.